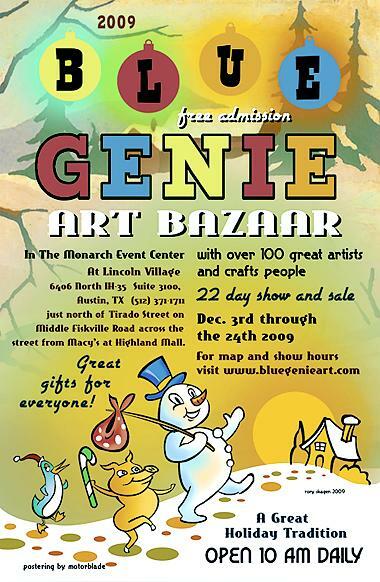 One of my favorite holiday events in all of Austin starts tomorrow, the Blue Genie Art Bazaar! Stop by the Monarch Events Center and score some of the best homemade gifts in the Lone Star State by Peeps like Chia, Travis Nichols, Ornamental Things, Harrilu, Will Herron and tons more. Included in that tons more is the Austin Craft Mafia where you can find all kinds of fun jewelry by yours truly to stuff in your favorite fashionistas stocking. Music, cocktails, shopping and crafts – what’s not to love stop by the Blue Genie Art Bazaar before Christmas Eve when it closes and say hello! P.S. Don’t forget Austin you can still get Naughty Secretary Club goodies at Parts and Labour and be sure to visit my booth at the Cherrywood Art Festival! Posted December 2, 2009 & filed under Austin, Christmas. Thank you also for recommending Alisa Burke! I'll check out her book for sure! It's called Cherrywine. As in "we can dance and party, all night, and drink some cherrywine.. uh-huh!"